Book 2 of the series! Luigi, a desperately poor man, breaks into the Basilica of Saint Francis in Assisi, Italy, to steal something of great value. He hides behind the wooden choir stalls and waits for nightfall. The howl of a wolf breaks the quiet of the night and a burst of warm air sends chills down his spine. Thus begins anotherAdventure with Sister Philomena, Special Agent to the Pope. 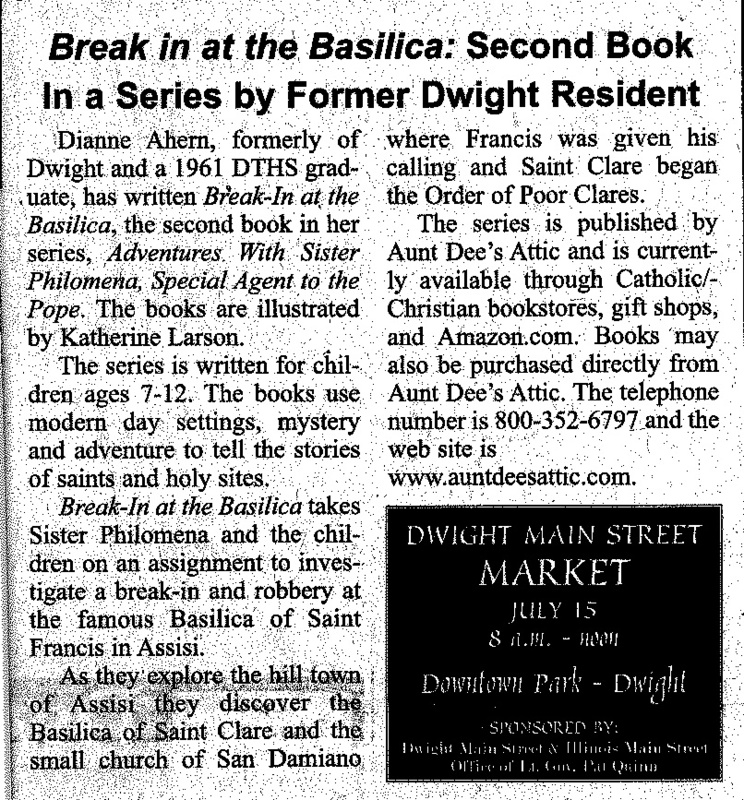 Eager to assist their aunt and find clues, Sister Philomena’s niece and nephew explore the basilica, study its frescos, sneak into the tomb of Saint Francis, wander through the hill town of Assisi, and end up in the little church of San Damiano. Every once in a while they spot a wolf, hear its howl or feel its presence. Is it real or a spirit? Good or evil? What is it trying to tell them? Woven into this great tale of adventure are the personal stories of Saint Francis and Saint Clare and the sights and sounds of Assisi. Hardback Gift Edition: Normally $24.95 but ON SALE NOW FOR $19.95! Break-In at the Basilica finds Luigi, a desperately poor man, breaking into the Basilica of St. Francis in Assisi, Italy, to steal something of great value. He hides behind the wooden choir stalls and waits for the right time. The howl of a wolf breaks the quiet of the night and a burst of warm air sends chills down Luigi’s spine. Thus begins this Adventure with Sister Philomena, Special Agent for the Pope. A boy, Riley, and his little sister, Delaney, are sent to Italy to stay with their aunt, Sister Philomena. At first the kids were sure this would be a miserable summer stuck in a convent with a bunch of nuns that do nothing but go to church and pray all day. Boy, were they wrong! Sister Philomena, the Pope’s private eye, is called upon to go to Assisi to investigate the break-in and theft of the priceless Chartula of Saint Francis and she has no alternative but to take the children with her. 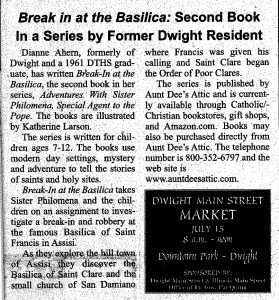 Eager to assist their aunt and find clues, Riley and Delaney explore the basilica, study its frescos, sneak into the tomb of Saint Francis, wander through the hill town of Assisi, and end up in the little church of San Damiano. Every once in a while they spot a wolf, hear its howl or feel its presence. Is it real or a spirit? Good or evil? What is it trying to tell them? Woven into this great tale of adventure are the personal stories of Saint Francis and Saint Clare and the sights and sounds of Assisi. The book also has an appendix of Italian words and phrases that will help young readers become world travelers.